‘Mules’ is a dark comedy about choices, trust, friendship, circumstances, poverty and drug smuggling. In ninety minutes with one set and three actors, this play achieves what plays aspire to be. It is dramatic, suspenseful, comedic and emotional. The dialogue is engaging, the characters are complex and the performances are superlative. Brandon Kleiman’s set design made me feel as if I was an extension of the action. I walk in to the intimate space of the Scotiabank Community Studio and face a large women’s washroom symbol. Aas I turn the corner, I have walked in to the women’s washroom. The walls look like large porcelain tile and the floor is a speckled linoleum. There are three washroom stalls on stage and a sink upstage right at the base of the audience risers. There is a sign that welcomes us to Vancouver Airport. Jennifer Lennon’s lighting design of bright white lights enhances that feeling of being in an airport washroom. John Gzowski’s sound design completes the full airport experience with distant PA announcements and the rumble of jet engines in the background. 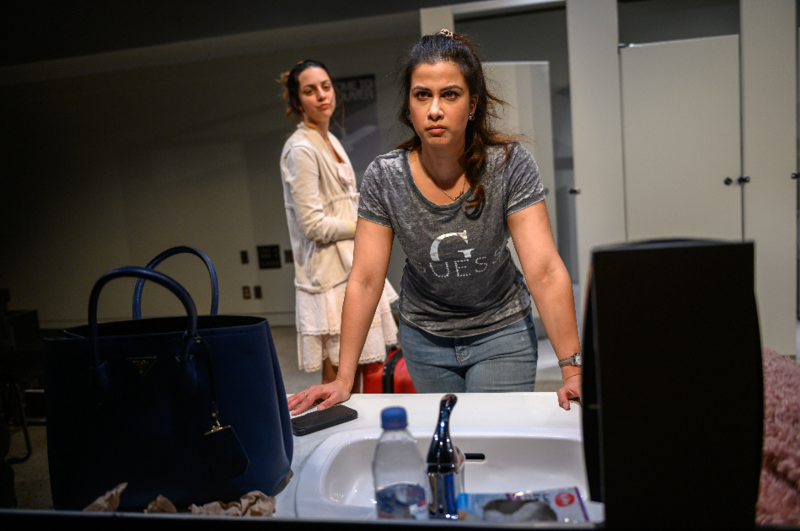 Playwrights Beth Graham and Daniela Vlaskalic have created a play with strong female characters facing a dilemma based on their choices to make a better life for themselves. Conflict arises from the situation in the airport washroom where they must deal with their circumstances and conflict in their daily lives. The exchange of dialogue and action kept me engaged and invested in the characters. There are times when I felt despair and times when I felt hope for each of them, but I never felt detached. Ms. Graham and Ms. Vlaskalic have developed compelling protagonists and I feel a lot of compassion for them as they navigate the problematic situation they have created. Director Vikki Anderson beautifully keeps the pace moving and never allows the action to slow down. Future audiences, however, are to be warned there are some extreme visual moments that are disgusting throughout the production but do add to the reality and some of the comedy of the situation. flowing and the characters personalities and actions believable. With her help, Crystal and Cindy achieve a strong connection on stage. I was most impressed with the performances of Eva Barrie as Crystal and Anita Majumdar as Cindy. These two powerhouse performers achieve a strong connection on stage while creating gutsy, realistic and believable people. Clad in a baby doll dress with her luggage in tow, Ms. Barrie has the arduous task of excreting numerous cocaine caplets into a bag and surrender them to Sully, Cindy’s ex boyfriend. Cindy has chosen a life of crime as a result of poor choices and needing money to pay for her extravagant lifestyle as a result of her involvement in the drug trade. As the story continues, the audience journeys forward into learning more about the lives of these two women. Cindy has become hard-edged and jaded while Crystal has remained positive and naïve but not stupid. The third character introduced is Troy (Tim Walker), the newly hired airport janitor who interferes with Cindy and Crystal’s plan. Troy insists he needs to clean the washroom, or he’ll be fired. Tory inadvertently discovers what Crystal and Cindy are concealing which further adds a comic spin to the physical action of the play, a difficult feat in a smaller space thanks to seamless choreography by Simon Fon. ‘Mules’ continues to March 2, in the Scotiabank Community Theatre at Streetcar Crowsnest, 345 Carlaw Avenue, Toronto. Tickets may be purchased at crowstheatre.com or telephone (647) 341-7390.